Speed Covers®. Clearphane®. Plastifoil®. Monza™ and Tessera™ sheets. Picture Perfect™ flat plant covers. And so many more pioneering products in the floriculture industry - over 12,000 different products bear the name of Highland Supply Corporation or its affiliated companies. Speed Sheets®. SizzlePak®. 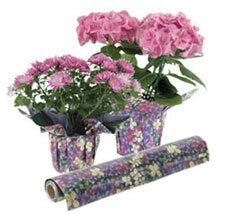 Floral Stemming products. Wire and design tools. Floral paper. And don't forget Easter Grass. And many other shredded products. Highland Supply Corporation - a pioneer in the floriculture industry since 1937. To see a more detailed description of our products and product catalog, please read over and complete the following form. In consideration for access to this web site, you as SUBSCRIBER agree as follows: INFORMATION ON THIS WEB SITE OR IN ANY CATALOG OR BROCHURE IS PROVIDED "AS IS" WITHOUT WARRANTY OF ANY KIND, EITHER EXPRESS OR IMPLIED, INCLUDING, BUT NOT LIMITED TO, THE IMPLIED WARRANTIES OF MERCHANTABILITY, FITNESS FOR A PARTICULAR PURPOSE, OR NON- INFRINGEMENT. SOME JURISDICTIONS DO NOT ALLOW THE EXCLUSION OF IMPLIED WARRANTIES, SO THE ABOVE EXCLUSION MAY NOT APPLY TO YOU. Information on this web site may contain technical inaccuracies or typographical errors. Information may be changed or updated without notice. Highland Supply Corporation may also make improvements and/or changes in the products and/or the programs described in this information at any time without notice. Any comments or materials sent to Highland Supply Corporation including feedback data, such as questions, comments, suggestions, or the like regarding the content of any such documents (collectively "Feedback"), shall be deemed to be the property of Highland Supply Corporation and Highland Supply Corporation shall have no obligation of any kind with respect to such Feedback and shall be free to reproduce, use, disclose, exhibit, display, transform, create derivative works and distribute the Feedback to others without limitation. Further, Highland Supply Corporation shall be free to use with no further obligation to the provider of the Feedback any ideas, concepts, know-how or techniques contained in such Feedback for any purpose whatsoever, including but not limited to developing, manufacturing and marketing products incorporating such Feedback. Information Highland Supply Corporation publishes on the World Wide Web, compact discs, magnetic tapes, photographs or other media may contain references or cross references to Highland Supply Corporation products, programs and services that are not announced or available in your country. Such references do not imply that Highland Supply Corporation intends to announce such products, programs or services in your country. Consult your local Vendor business contact for information regarding the products, programs and services which may be available to you. Highland Supply Corporation makes no representations whatsoever about any other web site, which you may access through this one. When you access a non-Highland Supply Corporation web site, please understand that it is independent from Highland Supply Corporation, and that Highland Supply Corporation has no control over the content on that web site. In addition, a link to a non-Highland Supply Corporation web site does not mean that Highland Supply Corporation endorses or accepts any responsibility for the content, or the use, of such web site. It is up to you to take precautions to ensure that whatever you select for your use is free of such items as viruses, worms, trojan horses and other items of a destructive nature. Other than for this Agreement, agreements with Highland Supply Corporation, shall not be binding unless approved by Highland Supply Corporation’s President, Executive Vice-President or Senior Executive Vice-President. IN NO EVENT WILL Highland Supply Corporation BE LIABLE TO ANY PARTY FOR ANY DIRECT, INDIRECT, SPECIAL OR OTHER CONSEQUENTIAL DAMAGES FOR ANY USE OF THIS WEBSITE, OR ON ANY OTHER HYPERLINKED WEBSITE, INCLUDING, WITHOUT LIMITATION, ANY LOST PROFITS, BUSINESS INTERRUPTION, LOSS OF PROGRAMS OR OTHER DATA ON YOUR INFORMATION HANDLING SYSTEM OR OTHERWISE, EVEN IF WE ARE EXPRESSLY ADVISED OF THE POSSIBILITY OF SUCH DAMAGES. ALL RIGHTS ARE RESERVED. This Web Site contains material protected by Trademark and Copyright laws. None of the material may be reproduced or transmitted in any form or by any means electronic or mechanical, including photocopying, or by any information storage and retrieval system, without prior written permission from Highland Supply Corporation. Highland Supply Corporation grants the SUBSCRIBER the right to use the material in this Web Site by viewing, downloading, storing and making copies for private use only. None of the above grants any person or entity the right to disseminate, distribute, copy or include any of the material in a published work, whether in physical, electronic or other form, or modify or create derivative works based on the information in this Web Site without prior written consent from Highland Supply Corporation. As additional consideration for access to the information contained on this web site SUBSCRIBER agrees not to modify, alter, change or amend any information, data, photographs, artwork or other information obtained or downloaded from this web site. Additionally, SUBSCRIBER agrees that any information, data, photographs or other information obtained or downloaded from this web site will be used by the SUBSCRIBER only in its original unmodified form and only for the limited purpose of SUBSCRIBER'S use relating to the purchase of products and services set forth in the Catalogue and for no other purpose. For any action or dispute arising from or relating to access to this web site, the purchase of any products of Highland Supply, patents, trademarks, technology or any other intellectual property owned by or licensed to or by Highland Supply Corporation, its Licensors, or any activities, rights or interest of Highland Supply Corporation, its Licensors, or any of their officers, trustees, directors, employees, consultants, advisors, or affiliates, the Parties hereby consent to the exclusive jurisdiction of the State of Illinois, United States of America and hereby consent and agree that any action or proceeding shall be brought in the appropriate state court in the State of Illinois covering Madison County. Each of the parties hereto hereby irrevocably waives, to the fullest extent it may effectively do so, any objection either party may have to such venue, any defense of an inconvenient forum to the maintenance of such action or proceeding, and any rights to remove such action to federal courts. If the action cannot be brought in any Illinois state court, the action shall be brought in United States District Court for the Southern District of Illinois, and the parties hereby waive any right to transfer or to seek transfer of any such action to any other United States District Court. The parties knowingly and expressly consent to the foregoing terms and conditions. Each party is authorized to enter into this Agreement on behalf of its respective party. THE "I ACCEPT/AGREE" BUTTON FOLLOWS. THIS BUTTON SHALL THEN ALLOW ACCESS TO FURTHER INFORMATION ON THE WEB SITE. IF THE SUBSCRIBER DOES NOT CLICK ON THIS BUTTON SUBSCRIBER WILL HAVE NO RIGHTS TO ACCESS THE ADDITIONAL INFORMATION ON THIS WEB SITE. "Highland always strives to better serve its customers and potential customers, and providing the information above will help us do that in a more effective and efficient way. Please note that Highland does not share this information with third parties, thus the information you provide will not be put on commercial mail lists by third parties. A cookie will be placed in your browser so that you may bypass this screen on future visits." products used throughout this website. For more information, please contact Highland Supply Corporation.